England snatched victory by a massive innings and 71 runs as they were cleaned up for 304, and take a priceless 1-0 lead with three Tests to be played. Swann was the main English spearhead who stretched Aussies to their limits on the fifth day and finishing his figures with an impressive 5-91 to bowl England to their 100th Test win over Australia. The hosts suffer the ignominy of their first innings defeat at home since their capitulation to the West Indies at Perth in 1993 and, to be brutally honest, it's hard to see them bouncing back to win two of the next three games. Very strange things had happened today, but still in order to bounce back they will need something exceptional to counter the ever resurging English team. Man of the Match undoubtedly went to Kevin Pietersen for his master class act scoring a double century and wicket of Micheal Clark. It was one of the days when Aussies would have been praying hard for a miracle to happen. The weather previous day was pretty unpredictable as there were rain delays.So this was one of things the green caps would have expected to play in their favour.Also still Hussey and North were the last trump cards to be used. But they were very short lived when Hussey who was first to go just after making 52. 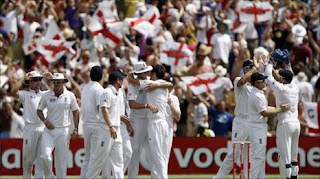 Hussey till now had a pretty decent series having a century and two half centuries under his belt.Just berfore the close of the fourth day Pietsersen with his rare wicket got Clark out , who was playing pretty good under the circumstances had jolted the team hugely, eventually bringing spark of joy. Next on a score of 281 a double blow from Anderson came removing Haddin , and Harris . Harris got a king pair, making him only the second Australian to do so, this brought Anderson on a hatrick, but here he had to wait Swann's over to conclude in order to complete the feat. Swann in the next over bowled North with a beautiful delivery. They fell just like a pack of cards literally . In the next over Anderson came to bowl who was on the hatrick with jam packed slips all over but surprisingly no short leg. This is what happened he speared up a short ball at Doherty who had great amount of un-ease playing it fending off to a place where a short leg fielder if in place would have done the trick for him.So unfortunate for Anderson losing chance of what is one of the most unique achievements in cricket.Later in the 95th over Swann got rid of Doherty who bowled him with a good delivery. He played forward, but positioned himself for extravagant turn when there was none. The ball snuck through the gap between bat and pad and clattered into the stumps. Then after a little resistance and crossing 300 mark finally. Swann eliminated the last hurdle from their well deserved victory bowled Siddle out with a classical off spinner's dismissal, drawing him forward and spinning back sharply from outside off to fizz through bat and pad and clatter into off stump.